Mat Paradis’ passion for playing and coaching sports helped push him towards the fitness field while pursuing a career in soccer. It was there that he gained a passion for the gym life and training others. Either on or off the field or ice, he knew that training younger athletes is what he wanted to do! While receiving an Advanced Diploma in Physical Fitness Management at Cambrian College, he got the opportunity to play for the Cambrian Golden Shield Soccer team, helping them bring back post-season soccer games to Northern Ontario! During the off-season he had the opportunity to play for the local Semi-Pro Football Team Sudbury Spartans and in the Local Premiere Soccer Division under Stack City F.C. He also spent time coaching local high school soccer teams and hockey teams. 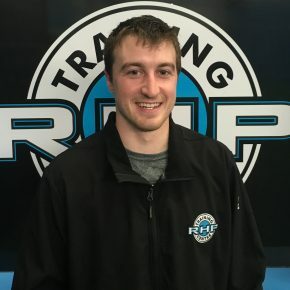 Once graduating with honours and receiving OCAA All-Academic Awards he knew joining the RHP Training Centre staff was the right choice for him!